Burning oil, gas and coal has polluted our air, water and land for decades. Now it’s changing our climate even faster than scientists feared it would. We know we can have healthier communities right now and a livable future for ourselves and generations to come. But to get there, we must transform the way we produce and consume energy. That’s why we’ve been working to transition our communities to 100% renewable energy. 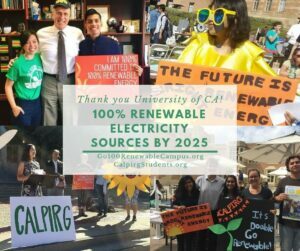 Over the course of two years CALPIRG Students built support for 100% renewable energy in California. We generated the support of 20,000 students through petitions, signed on 200 student organization leaders and over 100 faculty, worked to get resolutions passed by eight University of California student governments, and held educational events including solar power concerts at UC San Diego, UC Davis, and UC Riverside. We also organized 100 students to attend a big Lobby Day at the Capitol in support of SB 100, a bill that would commit CA to 100% clean electricity, and met with at least 60 elected officials to share why students care about a clean energy future. Following our sustained campaign, in Fall 2017 the California state legislature passed and then Governor signed SB 100 into law, which commits CA to zero carbon electricity by 2045. We also wanted to see strong actions by our universities, which should be leading the way to a clean energy future. 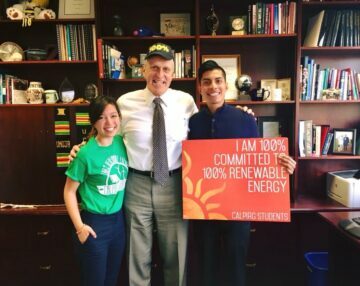 And after building grassroots support, meeting with Chancellors and other University officials and testifying to the UC Board of Regents, the University of California announced its commitment to 100% clean and renewable electricity by 2025. Plastic bags pollute our ocean and harm marine wildlife. That’s why CALPIRG worked for eight years to help make California the first state in the country to bag single –use plastic grocery bags. But right after the historic state law passed, big plastic companies qualified a ballot measure for the November 2016 Election to try to repeal our ban on bags. 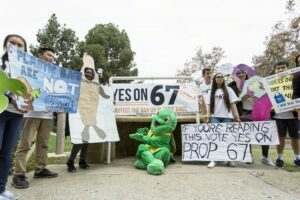 We then launched a campaign to mobilize students on campus to turn out in support of Prop 67 to protect the bag ban. Across the state we educated 30,000 students on the issue through class announcements, mobilized over 10,000 students to pledge to vote yes, organized press events both on and off campus to get media attention on the issue. Our most successful press event was our Save the Bag Ban Alternative Spring Break Tour where we organized 30 students to spend their spring break doing press events with local elected officials in seven cities from Oakland to San Diego. After months and months of hard work, we are proud that California voters saw through the deceptive ballot measure and voted to continue to protect our ocean. 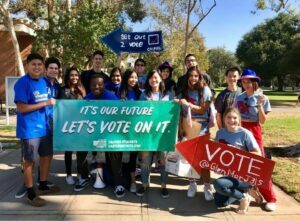 In 2018 our New Voters Project ensured that thousands of newly eligible young voters registered to vote and cast a ballot by Election Day. 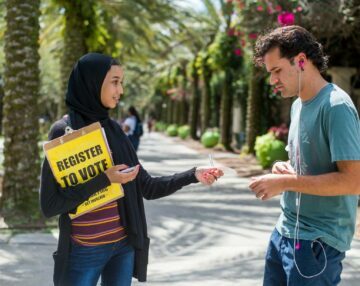 In total, our team helped register more than 6,000 students to vote and made more than half a million Get-out-the-Vote contacts. Student volunteers worked with student governments and the vote coalitions to reach out to students in their classes, out on campus, or in the dorms; and hosted “Parties at the Polls” on Election Day events to get students engaged and excited to vote. The parties featured music, free food, photo booths, balloons, a “vote goat,” and non-partisan information for students going to cast their ballot. Los Angeles Mayor Eric Garcetti came to the UCLA party, where turnout was 500% higher than in 2014. Turnout was so unexpectedly high, some polling locations on college campuses including UC San Diego (which saw a 123% increase in turnout from 2014) and UC Riverside ran out of ballots. 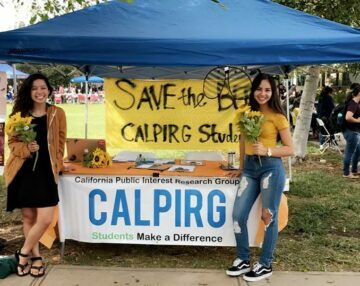 In 2016, CALPIRG worked with the University of California and the Secretary of State’s office to help create more opportunities for student outreach and engagement in elections. This year, students received all-campus emails and social media ads with our castudentvote.org registration site, and the Secretary of State launched a “Ballot Bowl” competition for universities to compete to see who could turnout the most students. Following the election, CALPIRG is working to help address issues with voting that students identified, including making sure that polling places have good backup plans in place so students don’t have to wait until midnight to vote, and working with more campuses to open up voting centers where students can vote early and register to vote the same day as the election. The Pell Grants are the foundation of our national investment in higher education, and are essential for ensuring low-income students have the opportunity to attend and complete college. 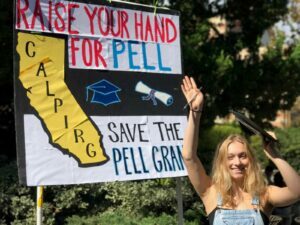 That’s why we joined higher education organizations around the country to stand up to a proposed $2.3 billion cut from the Pell Grant surplus. Over the course of the year we collected petitions to our elected officials and sat down the staff of Senator Boxer and several members of the House of Representatives. And we won! Last quarter, Congress passed a budget without a single dollar taken from the program. 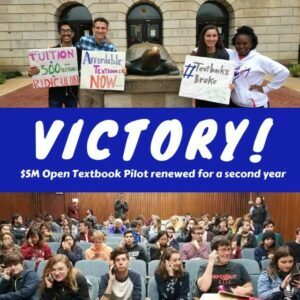 We’re working to make textbooks more affordable by promoting online educational resources while also educating faculty on the burden caused by online access codes that require payment to access homework online. We worked to convince Congress to include the first ever investment in open textbooks in the federal budget. The $5 million pilot program at the federal level is expected to save American students more than $50 million dollars. We are at risk of entering the post-antibiotic era. Since their introduction, antibiotics have been a staple in protecting the public health. However, their overuse has led to the creation of “superbugs,” which cause illnesses that can’t be cured. Last year 2 million Americans got antibiotic resistant infections, and 23,000 people died. This is happening partly because 70% of antibiotics are sold to factory farms, where they are used on animals that often aren’t even sick. We have to stop the overuse of antibiotics, and protect our life-saving drugs. In March 2015, we helped convince McDonald’s to stop serving chicken raised on our life-saving medicines. Shortly after, Tyson Foods, a major chicken producer and McDonald’s supplier, followed suit. Then, in October, we convinced Subway, with more restaurants than any other chain in the United States, to make a commitment to stop serving any meat raised on antibiotics, starting with chicken by the end of 2016. 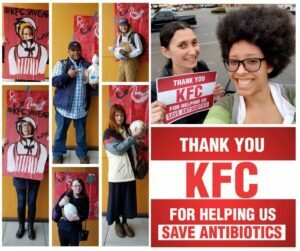 In April of 2017, KFC announced their commitment to stop serving chicken raised on medically important antibiotics by the end of 2018.